This February, Absolut Elyx, the world’s first luxury vodka created specifically for sipping, premiers a new range of Lovebird cocktails across ten of Hong Kong’s most prestigious bars. The latest copper drinking vessel to hit the city, the Lovebirds, offer a romantic gilded option for drinks on the year’s most amorous month. New copper Lovebird cocktails can be enjoyed at: Potato Head, Old Bailey, Los Sotano, La Petite Maison, Felix in the Peninsula, Bar Q88 and Fish Bar at JW Marriott, , M Bar at Mandarin Oriental and Red Sugar at Kerry Hotel. Lovebirds, often portrayed as muses, are sure to inspire romance this Valentine’s Day and Absolut Elyx, famous for their smooth vodka and Hollywood luxe aesthetic, introduces 9 cocktails across six outlets. Potato Head, offers Copper Wings (HK$120) mixing Crème de Mure, Fernet Branca, Falernum, Tamarind Syrup, and Lime. Old Bailey will be serving Feed The Birds(HK$100), a cocktail made with Jasmine syrup, fresh pineapple juice, fresh lemon juice, droplets ginger. Los Sotano offersThe Birds & The Bees (HK$150) comprised of lemon juice, Plymouth gin, honey and Ancho Reyes. La Petite Maison’s Robin(HK$120) is a concoction of pineapple juice, Absinthe, fresh Thyme, fresh sage, lychee syrup, lime juice and Prosecco. Felixintroduces Absolut Elyx to Kafir lime leaf, Crème de Framboise, ginger beer, and lime in the Firebird (HK$168). Bar Q88, gives guests Birds of Wisdom(HK$140) which infuses Absolut Elyx with Sichuan Pepper and mixes it with Chrysanthemum Ginger Tea Cordial, Lemon, and Mandarin juice. Fish Barserves up two variations, Romantini(HK$120) with fresh Passion Fruit, peach liqueur, and orange juice, or Fantasy Bubble(HK$120) serving Elyx with mixed berries, Aperol, raspberry syrup and lemon juice. M Bar serves up something For You (HK$185), and For Her(HK$185), the former including Violette Liquer, lime juice, taro cordial, egg whites and a special dash of Valentine’s Bitters – the latter includes Lillet, Antica Formula, citrus cordial, and a few dashes of Valentine’s Bitters. Red Sugar also offers two options, Birdie (HK$108) offering Absolut Elyx infused with Kafir lime leaves, homemade strawberry and coconut milk liquor, lime juice and vanilla syrup – Lazy Daisy (HK$108) features Absolut Elyx infused with vanilla and cherries and mixed with grenadine, pomegranate puree, lemon juice, Fernet Branca, egg whites and garnished with a giant marshmallow. 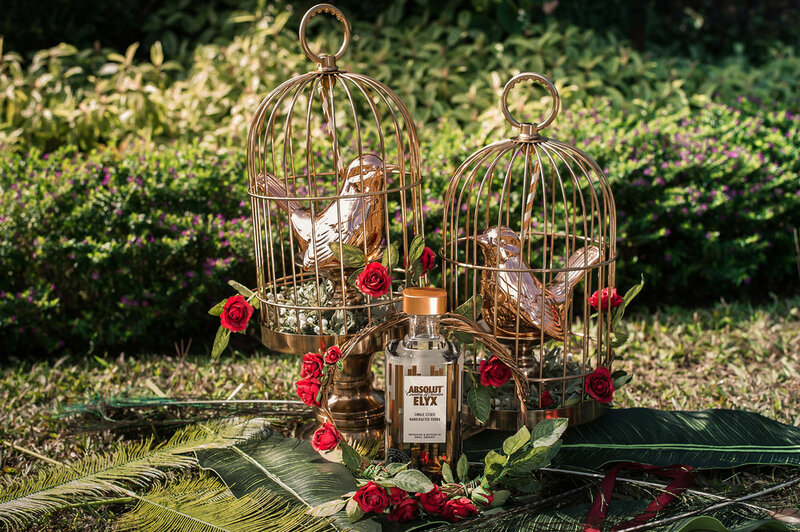 Known for its silky-smooth vodka and cutting edge designs, the Absolut Elyx and the new copper Lovebirds are making Valentine’s Day a little sweeter this year.